, a learned poet, critic, and antiquary, was born in 1669, and descended from <an illustrious Venetian family, which had been long settled in the island of Candia. He early applied himself to literature, and the study of Italian history and antiquities. In 1696 he instituted at Venice the academy Degli Animosi, and was the editor of the “Giornale de‘ Letterati d’ltalia,” of which he published thirty volumes between the years 1710 and 1719. His first musical drama, “L’Inganni Felici,” was performed at Venice in 1695, and between that time and his quitting Vienna, whither he was invited by the emperor Charles VI. in 1718, he produced forty-six operas, and seventeen oratorios, besides eighteen dramas, which he wrote jointly with Pariati. His dramatic works were collected and published at Venice in 1744, in 10 vols. 8vo, by count Gozzi; and in 1752 his letters were printed in 3 vols. by Forcellini, in which Dr. Burney, whom we principally follow in. this article, says, much sound learning and criticism are manifested on various subjects. But one of the most useful of his critical labours seems to have been his commentary on the “Bibl. 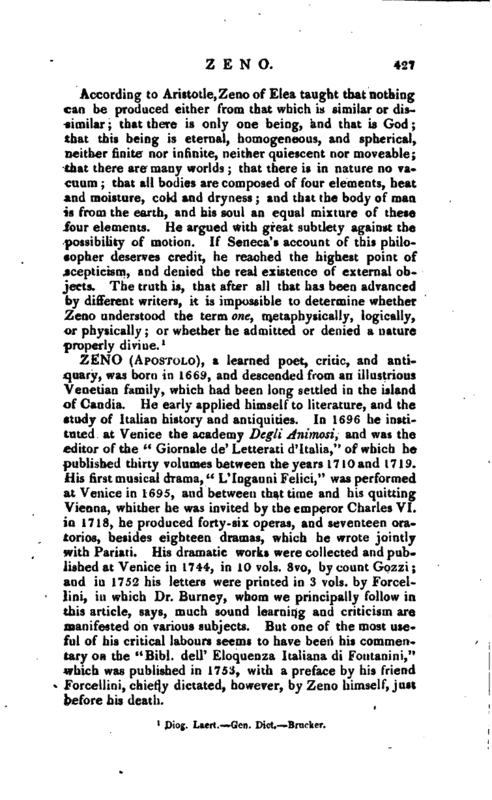 dell' Eloquenza Italiana di Foutanini,” which was published in 1753, with a preface by his friend Forcellini, chiefly dictated, however, by Zeno himself, just before his death. | After he was engaged as imperial laureat, he set out from Venice for Vienna in July 1718, but having been overturned in a chaise, the fourth day of his journey, he had the misfortune to break his leg, and was confined at an inn in the little town of Ponticaba, nearTrevisa, till September. He arrived at Vienna, the 14th of that month, “safe,” as he says, “if not sound and cured,” after twelve days of excessive suffering on the road. 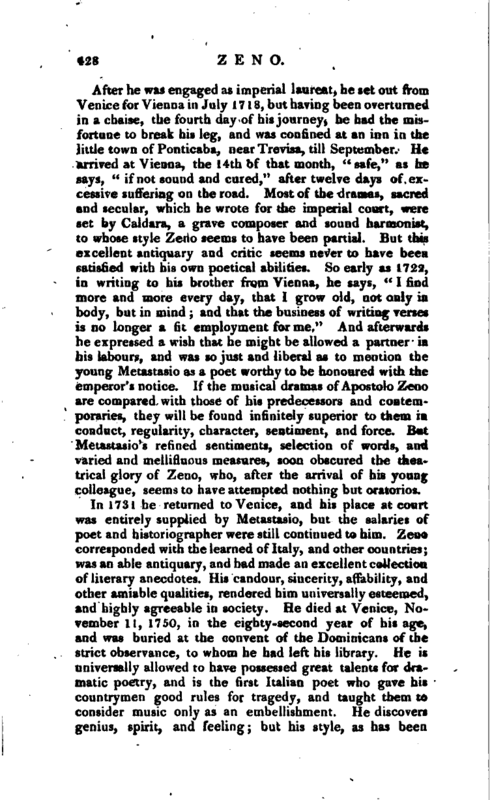 Most of the dramas, sacred and secular, which he wrote for the imperial court, were set by Caldara, a grave composer and sound harmonist, to whose style Zeno seems to have been partial. But thii excellent antiquary and critic seems never to have been satisfied with his own poetical abilities. So early as 1722, in writing to his brother from Vienna, he says, “I find more and more every day, that I grow old, not only in body, but in mind; and that the business of writing verses is no longer a fit employment for me.” And afterwards he expressed a wish that he might be allowed a partner in his labours, and was so just and liberal as to mention the young Metastasio as a poet worthy to be honoured with -the emperor’s notice. If the musical dramas of Apostolo Zeno are compared with those of his predecessors and contemporaries, they will be found infinitely superior to them in conduct, regularity, character, sentiment, and force. But Metastasio’s refined sentiments, selection of words, and varied and mellifluous measures, soon obscured the theatrical glory of Zeno, who, after the arrival of his young colleague, seems to have attempted nothing but oratorios. Barney’s History of Music, and Life of Metastasio. 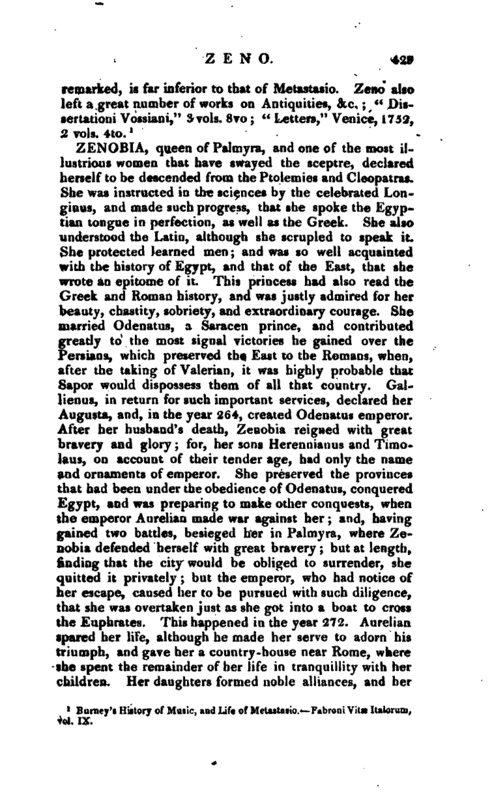 —Fabroni Vitae Italorum, vol IX.